IAM and NFFE-IAM members are mourning the loss of retired IAM Grand Lodge Representative Kenneth E. Richey and NFFE Veterans Affairs (VA) Council President Robert “Bob” Redding. Richey passed away at his home in Sun City West, AZ on May 2, 2014. He was three days shy of his 84th birthday on May 5, a birth date he was proud to share with the IAM. Richey served more than 50 years as an IAM member beginning as a shop steward in Aberdeen, WA. From there he worked as a Business Representative for IAM District 160 in Seattle. 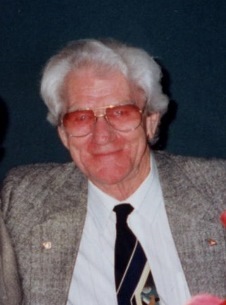 In 1988, he was appointed Grand Lodge Representative for the Western Territory, where he stayed until his retirement in 1997. Contributions in his name can be sent to Guide Dogs of America. Richey is survived by his wife of 34 years Barbara, daughter Cheryl O’Connor Chrt (Paul), stepchildren Maria Brown Jackson (Thom), and Jason Brown (Samantha); brother Wayne Richey (Kay), sister-in-law Carole Richey Pelela (Paul) and grandchildren Ryan and Eric O’Connor, Jacob Chrt, Quinn, Jillian and Kelly Jackson, and Molly Brown. 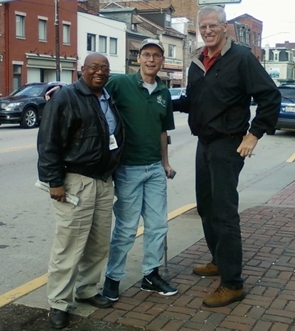 Former NFFE-IAM VA Council President Robert Redding, center, stands with President of NFFE-IAM VA Council Local 1904 Louis Jasmine, left, and current acting NFFE-IAM VA Council President Jeff Shapiro, right. Redding was a relentless advocate for the federal employees he served in the Veterans Health Administration (VHA). He began his career at the VA in Fargo, ND in 1992. He has been a NFFE member for over two decades. Serving as the President of since 2000, Redding was a tenacious spirit who fought to ensure federal employees were treated fairly in the VHA and the rest of the federal government. He passed away on May 20, 2014.